If you haven’t tried this Southern favorite, you’re missing out on an amazingly simple and comforting dish. Nothing warms up a cold evening and says home like a steaming bowl of this delicious soup, which, by the way, has only a trace amount of fat and is packed with fiber, protein and healthful nutrients. 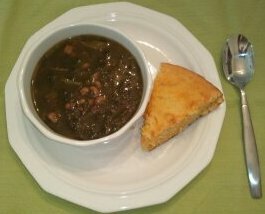 While it’s perfectly acceptable to make this scrumptious soup using (well-cleaned) fresh greens and soaked black-eyed peas, busy folks will appreciate whipping together this comfort food in about five minutes using canned and pre-packaged ingredients. (Allow for additional cooking time). Stir together all ingredients into a large pot or Dutch oven. Bring to a rapid boil, then reduce heat to a low-boil or simmer for a minimum of thirty minutes. The longer this soup cooks, the better it tastes, as the flavors continue to marry. I’ve cooked it as briefly as a half-hour and it’s delicious, but it’s even tastier (or I’m hungrier!) after it simmers an hour or two. Refrigerate leftovers—still yummy the next day! Serve with corn muffins or cheddar cornbread to soak up all that delicious pot liquor. Pot liquor (sometimes spelled pot likker) is simply the broth that remains after cooking greens. Since I’ve used canned ingredients in this quick-and-easy recipe, the addition of chicken and beef broths provide additional flavor and liquid to create sumptuous pot liquor. Collard greens, turnip greens, beet greens, mustard greens and dandelion greens have long been staples in the Southern and Appalachian diets, but they’ve recently garnered new attention as nutrition powerhouses that promote weight-loss and increase health. Only one-half cup of collard greens contains more calcium than a cup of milk! In addition, greens are chock-full of vitamins A, C and B6, as well as potassium, lutein, folate and magnesium. These nutrients and anti-oxidants help protect against heart disease, cancer and eye diseases like cataracts and age-related macular degeneration. I've had lots of requests for this recipe, and you'll find it especially useful, now that holiday time is approaching. Despite the long list of ingredients, it's incredibly easy to make and takes less than ten minutes to whip together. Enjoy! Preheat oven to 400 degrees. Wash the outside peel of the orange and zest it. Now cut it into four or five wedges, to squeeze out the juice, later. In a medium mixing bowl, combine flour, organic sugar, baking powder, cinnamon and sea salt. Using a pastry blender or fork, cut in Smart Balance spread until the mixture looks crumbly. Add agave nectar, Egg Beaters, milk, orange zest, cranberries, and approximately two tablespoons of fresh-squeezed orange juice (the juice from one or two wedges). Stir until mixture comes together into a ball. Dump onto lightly floured surface. (I use parchment paper sprinkled with flour, for easy-breezy clean-up). Knead dough about ten times, adding a little extra flour, if needed, to keep your hands from sticking to it. Pat into a 9-10” circle. Drizzle the juice from another orange wedge over the top of the dough, then spread it out with your fingers. 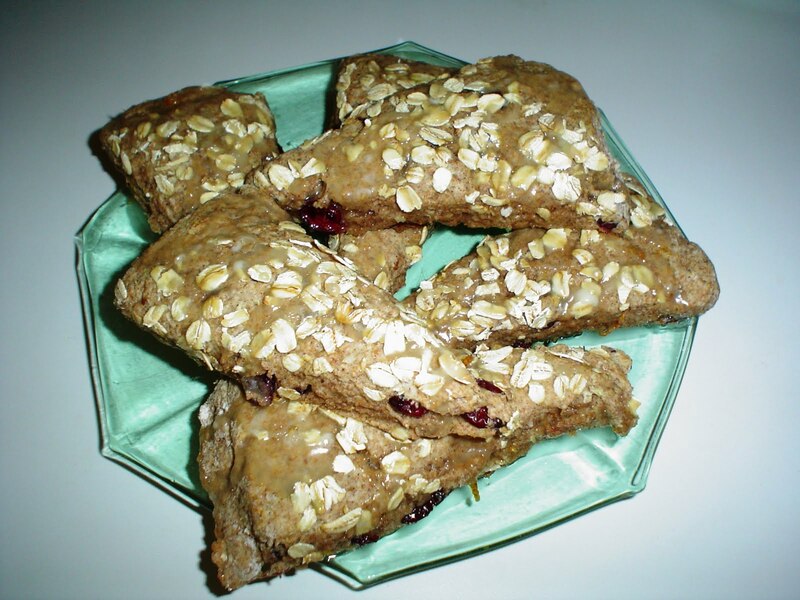 Sprinkle uncooked oats over the top, then cut the dough into twelve wedges. Transfer scone wedges to a pizza pan or rectangular pan misted with non-stick cooking spray. Leave about one-half inch between each wedge. Bake for 12-15 minutes, or until lightly browned. Meanwhile, place organic powdered sugar in a small bowl and squeeze the juice from another orange wedge (about a tablespoon, maybe less), over the sugar. Mix well, creating a glaze. Remove scones from oven. While still hot, drizzle orange glaze over them. Serve warm. Want to spice up your evening? This dish'll do the trick! Thanks to Holly, who sent the recipe of her husband's favorite dish to be "tweaked" into a healthy, nutritious meal she'll feel great about serving. Preheat oven to 400 degrees. 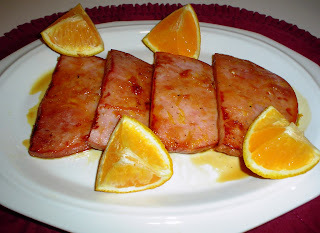 Cut raw chicken breast into bite-sized pieces. Dust with flour. Add to saucepan lightly sprayed with cooking spray. Drain juice from tomatoes and green chilies into the pan. Add all seasonings. Sauté five minutes, or until chicken is opaque. Add onions, peppers and tomatoes and green chilies, then cover the pan and cook over medium-low heat until veggies are tender. Meanwhile, lightly mist a 9-10” casserole dish with cooking spray. Lay two tortillas in the dish and up the sides, slightly overlapping. Spread one cup of fat-free refried beans over tortillas. Spread chicken mixture evenly over the beans. 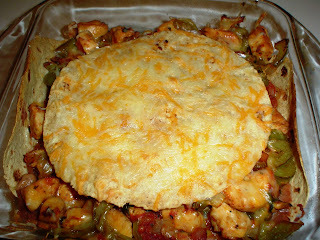 Lay the third tortilla on top of the chicken mixture, and sprinkle with cheese. Bake for 15 minutes, or until cheese is melted and juices bubble. Serve with a small side of Mexican rice (yellow saffron rice cooked with ¼ cup of tomatoes and green chilies) and fresh orange wedges for a delicious meal. Serves four. Counts as protein, slow carb and fast carb. Need a quick lunch or dinner idea for two? Four? More? This hearty soup and side easily doubles—or triples—and can be on the table in a flash. (Easy to pack for lunch the next day, too)! Set oven to broil. Chop onion and place in medium saucepan. Add juice from tomatoes and sauté until onion begins to soften. Meanwhile, cut tortillas into quarters. Place on broil pan lightly misted with non-stick cooking spray, like Smart Balance Omega-3. Lightly dust with ½ teaspoon taco seasoning. Place under broiler for 3-5 minutes. Now, add beans and tomatoes to onions in saucepan. Stir in ¼ cup fat free sour cream and 1 teaspoon taco seasoning. Stir well and bring to a boil. Remove tortilla chips from oven, turn over, and return to oven. Turn the oven off and allow tortilla chips to “toast and dry” in the hot oven, approximately three minutes. Ladle soup into two bowls, topping each with a tablespoon of cheese and a teaspoon of sour cream. Serve with hot tortilla chips. Counts as protein (black beans, tortillas), fast carb (sour cream, tortillas), and slow carb (beans, tomatoes). Besides the fact that they really taste much better, homemade baked tortilla chips (when using the whole wheat, high-fiber, low-carb tortillas) add as much as five additional grams of protein per tortilla (four large chips). Their high fiber content is more filling than bagged tortilla chips. We like LaTortilla Factory Low Carb High Fiber Original Whole Wheat tortillas, which have seven grams of fiber and five grams of protein per tortilla. Fiber and protein are important factors in weight loss. Every good cook needs a comfort food recipe to nurture the spirit, as well as the body. Here’s one you can feel good about serving to your family, because it’s low in fat, calories and sodium. Set oven on broil. Pour a small amount of water in the bottom of your oven’s broil/grill pan to prevent splattering and make clean-up easier. Mix all steak ingredients together in a small bowl. Form four oval-shaped patties, approx. 1/4” thick. Broil five minutes in oven, then turn and broil for five more minutes, until browned throughout. Meanwhile, sauté onions in a skillet lightly coated with non-stick spray. Mix cornstarch with about a quarter-cup of beef broth in a small container with lid, and shake until well-mixed. Add horseradish, and shake again. When onions have softened, pour remaining beef broth into skillet, then stir in cornstarch and horseradish mixture. Add ground black pepper to taste, if desired. Stir over medium heat until thickened. Pour onion gravy over Salisbury steak patties. Serve over yolk-free egg noodles, wild rice or smashed, boiled red potatoes. Add edamame seasoned with lemon pepper, or green beans as a healthy side dish. Counts as fast carb (noodles or rice), slow carb (veggies) and protein (steaks and gravy). Serves four. Can’t face the day without your morning cuppa joe? I would never ask you to do that! (You don’t want to see me without mine, either). Did you know there’s a way to enjoy flavorful, latte-like coffee that’s actually good for you? It’s true. 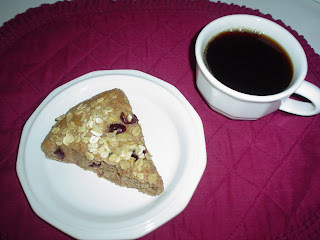 Here’s a decadent delight that will boost your morning protein intake, satisfy your sweet tooth, and make those expensive trips to Starbucks a thing of your past. Whisk together the first four ingredients in a small bowl until well-blended, with a bit of froth on top. Add three to four tablespoons of this creamy protein blend to your mug of hot coffee. Stir well. 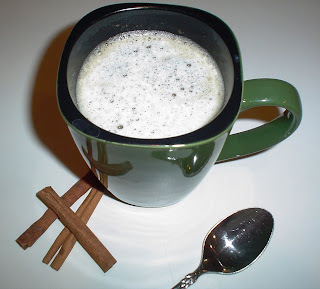 Garnish with a spoonful of the blended froth and an extra dash of cinnamon, if desired. This will make enough for 4-5 mugs of coffee, depending on cup size and the amount of creamy protein blend you use. Store extra in a small container and refrigerate. This will keep for up to one week, but you may want to take it along to work for your morning coffee break, or to share with your co-workers. Protein is the major building block of muscles, blood, skin, internal organs (think brain and heart), and even hair and nails. The Recommended Dietary Allowance (RDA) for protein is 56 grams a day for men and 46 grams a day for women, though the American Journal of Clinical Nutrition reports that increasing protein intake above this amount leads to increased weight loss, a lower amount of stored fat and prolonged feelings of fullness. Aim for at least fifteen grams of protein with each meal, with an additional few grams of lean protein thrown in at snack times, when possible. Don't give up carbs, however; our bodies need those, too! Protein powder can help you achieve higher protein intake, without ingesting unnecessary fat and calories. Now, rest assured, there are some yucky-tasting protein powders out there. I know, because I’ve tried ‘em! My favorite is EAS 100% Whey Protein Powder in vanilla flavor. Another good brand is Designer Whey. Soy protein is also fine, if you prefer. Make sure you choose a protein powder with at least 18 grams of protein per scoop (four tablespoons), and less than 4 grams of sugar. You’ll find that quite a few of my recipes contain protein powder, as it’s a great sweetener, thickener, and protein additive that can help push you into fat-burning mode while adding flavor to your food and drinks. Nothing says, "Dinner's ready!" like the aroma of Italian cooking. This slimmed-down version of one of my family’s favorite meals will be one you’ll turn to again and again and is perfect for guests or Sunday dinner. On a lazy day, start this cooking over low heat, check it every thirty minutes or so, and then settle down to a dinner that’ll keep your family talking for weeks to come! Remove casings from sausage links. Cut each link into six equal pieces. Roll each piece into a small meatball. One serving of meat/protein is approximately six meatballs. Over medium-low heat, cook meatballs in olive oil approximately 25-30 minutes, until browned. It’s important to cook over low heat, as olive oil isn’t intended to high-heat frying. Plus, slow cooking the meat will render out more fat. If the meat begins to dry out, pour up to half of the can of tomato puree over the meatballs to keep them juicy. When meatballs have lightly browned, drain excess oil and broth from the pan, leaving a small amount to prevent burning. Add onions and peppers to the pan, cover with a lid, and cook until onions are soft and turning clear. Add remaining tomato puree, diced tomatoes, garlic and seasonings. Simmer over low heat thirty minutes to an hour, stirring occasionally. The longer this cooks (up to two hours) the better it will taste. During last fifteen minutes of cooking, in a separate pot, boil multigrain pasta in one can of organic chicken broth (for added protein and flavor) and water to cover. Cook until al dente, and drain. In the photo above, I've used angel hair pasta, but I often make this with farfelle (bowtie) pasta, as well. 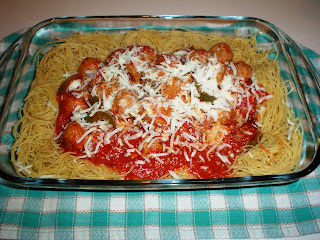 Place the pasta on a large, deep platter or bowl, then pour the Italian sausage, vegetables and sauce into the center. Sprinkle with freshly grated Parmesan or Romano cheese, if desired. Serve with a green salad and organic dressing. Bread is not required with this meal, as the pasta serves as your fast-burning carbohydrate for the meal. This recipe serves 4-5 people. (One fist-sized portion of pasta, one fist-sized portion of veggies and sauce, and six meatballs), plus unlimited garden salad. If you're cooking for two or three people, rest assured that this recipe refrigerates well and will reheat as a tasty lunch, tomorrow. Pasta isn't the evil we've all been taught to fear, however, white pasta isn't very good for you. It's much higher in "bad carbs" than multigrain pasta, which is naturally higher in fiber and rich in protein. Plus, brands such as our personal favorite, Barilla PLUS, contain omega-3 fatty acids, which make it a heart-healthy meal.